The Census Bureau estimates that Newark has experienced its first population increase since the 1940s, growing by 2.4 percent since 2000. New Jersey’s largest city joins several other long-suffering cities — including Milwaukee, Washington, D.C., St. Louis, Cincinnati and Richmond — that have reversed decades of loss by gaining population in the 2000s. Other Northeastern and Midwestern cities — including Philadelphia, Detroit, Baltimore, Cleveland, Pittsburgh, Buffalo and Toledo — have continued to lose population during the current decade. Most of these cities, however, saw their losses slow substantially between 2007 and 2008. A handful of cities that had been losing population between 2000 and 2007 — including Chicago, Oakland, Tulsa, Minneapolis, Salt Lake City and Bridgeport, Conn. — recovered and gained people between 2007 and 2008. More than 80 percent of cities of 100,000 people or more gained population over the past year. In New Jersey, the eight cities classified as “urban centers” by the State Development and Redevelopment Plan — Newark, Jersey City, Paterson, Elizabeth, Trenton, Camden, New Brunswick and Atlantic City — had a combined population growth rate of 0.30 percent between 2007 and 2008, nearly equal to the statewide growth rate of 0.34 percent. In contrast, for the first seven years of this decade, the state as a whole grew at a rate five times faster than the urban centers. In recent decades, the fastest-growing places in the state have predominantly been suburban townships, with most cities, towns and boroughs typically growing much slower or even losing population. In the 1970s, when New Jersey’s and the nation’s cities were suffering their worst declines, 19 of the 20 fastest-growing municipalities in New Jersey were townships. In the 1980s, it was 15 of the top 20; the 1990s similarly saw 15 townships among the 20 fastest-growing places. Even looking at the whole decade of the 2000s so far, townships make up 17 of the 20 municipalities with the fastest 2000-2008 growth rates. But in the past year, this trend has changed markedly. Of the 20 municipalities with the fastest percent growth rates between 2007 and 2008, only five are townships; the rest are cities, towns or boroughs. In fact, this trend has been developing since 2004; fully half of the 20 fastest-growing municipalities in New Jersey between 2004 and 2008 are cities, towns or boroughs. While not a hard-and-fast rule, places incorporated as townships tend to have lower population densities and more segregated land uses than cities, towns and boroughs, which are characterized by higher densities, a mix of land uses and well-connected, grid-like street networks. The resurgence of population growth in more compactly developed places thus represents movement toward the kind of center-based development called for in the State Plan. 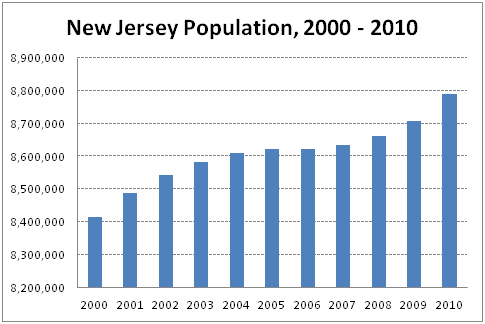 This phenomenon of new population growth taking place in traditional cities and towns is not limited to New Jersey. A recent USA Today article found population “bouncing back” in cities all across the country in the past year, in some places even outpacing suburban growth. The Express-Times in eastern Pennsylvania’s Lehigh Valley also highlighted the trend and took particular note of the slowing of suburban development, which in recent years in the Lehigh Valley has been fueled largely by out-migrants from New Jersey. What remains to be seen is whether widespread city population growth is the beginning of a long-term trend, driven by demographic changes and increasing interest in redevelopment and infill projects, or a short-term response to the economic downturn, which has already manifested itself in a dramatic decrease in mobility between 2007 and 2008. If you have any questions about this issue of Future Facts, please contact Research Director Tim Evans (timevans njfuture org) . More about New Jersey Future’s work. Become a member of New Jersey Future. May 16, 2007 Old Cities, New Potential? Why promote Newark’s gain at the expense of other cites? Census data is pretty easy to read. What happened here? This is an easy one to explain. Note the date of the post — July 15, 2009. Obviously, it would have been impossible to compute a 2000-to-2010 population change for Philadelphia (or any other city) in 2009, right? At the time of the post, the most recent city-level population estimates available were from 2008, which is why the arguments in the post rely so heavily on 2007-to-2008 year-to-year changes.